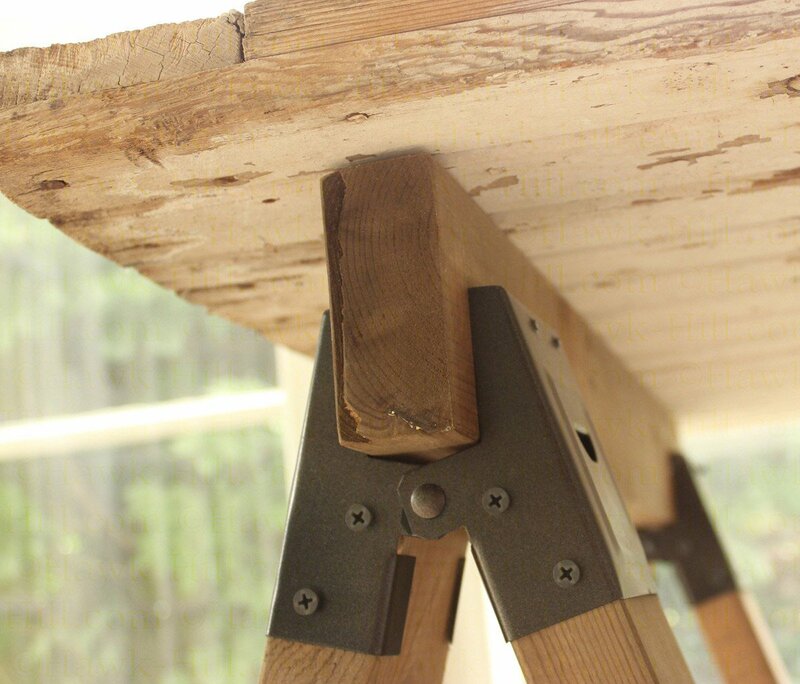 To create a polished finish on the final product, pause here and paint the sawhorse brackets. The black coating isn’t terrible, but for indoor use I think a premium finish adds a look of quality. I thought a coat of oil rubbed bronze spray paint elevated these basic shop-grade brackets into something more appropriate for interior use. Is it just me, or do these brackets look VERY happy to be repainted? 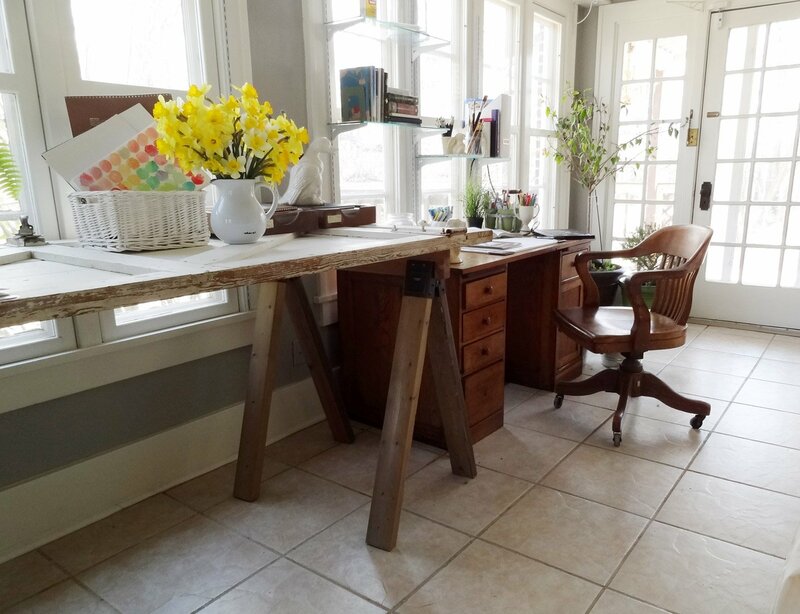 To create a counter-top height table top, the 4 legs need to be 32 inches long each. For Stability: If you have access to a miter saw, cut one end of each leg at a 55° angle, this creates a bit more stability and finished look. 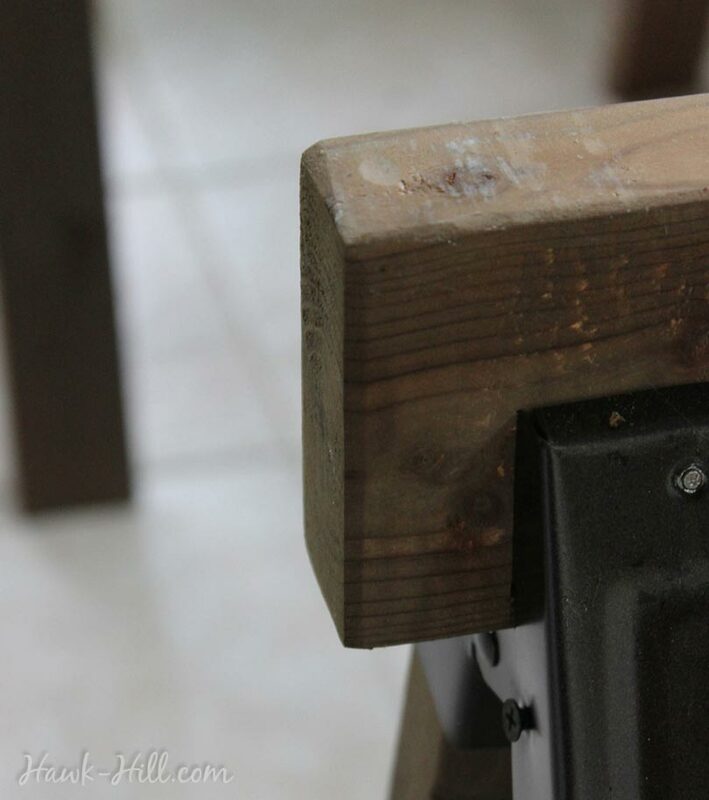 For a secure surface, cut the boards for the top of the sawhorse to a length that is equal to 80-85% of the depth measurement of your tabletop. After cutting lumber but before construction, stain or paint the cut lumber. You will also need to sand any rough edges and sand off any lumber-yard stamps or dings from sawmill machinery. Once sanded clean (5 minutes, with a palm sander– one of my best tool purchases ever! ), and dust removed, you can paint or stain the wood. I used a homemade stain made with vinegar, steel wool, and earl grey tea (Interestingly, someone figured out that Earl Grey darkens the shade of the stain, you can get the recipe on Instructables). Linseed Oil painted on the lumber after the stain is dried and set (About 12-24 hours) can add a richness to the grain, but since I did this project in the dead of winter and was desperately ready to move the wood out of my freezing workshop and into the house, I skipped the oil, and hit it later with some beeswax furniture polish. 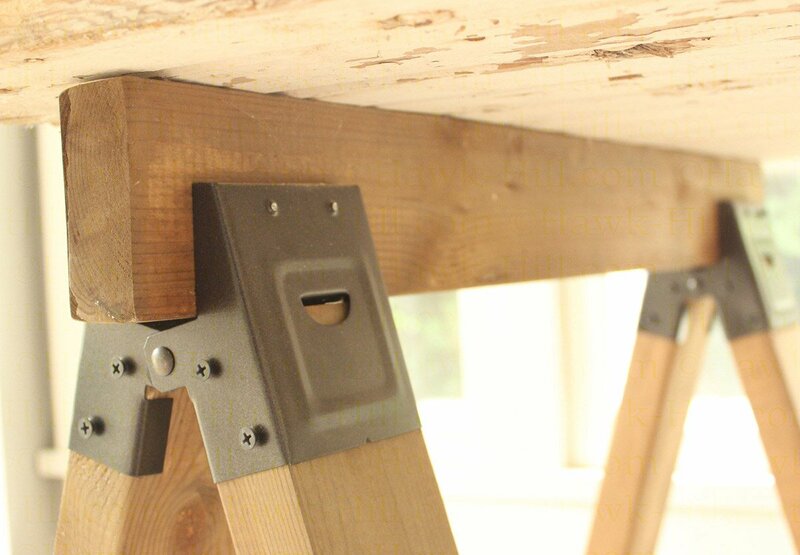 Following the instructions on the package of the brackets, assemble your sawhorses. Hammer nails (Learn from my mistake: Nails, not screws! Drywall screws left heads extending not-quite-flush) into each of the pre-punched nail holes in the brackets. If you cut the legs with an angled bottom, double check your ends before adding the nails. I’m not proud to admit it, but I had to unscrew screws and flip boards so that the angles were flush with the floor! I used screws instead of nails, and although they made the project faster, they did not end flush with the surface of the metal, as nails would have. 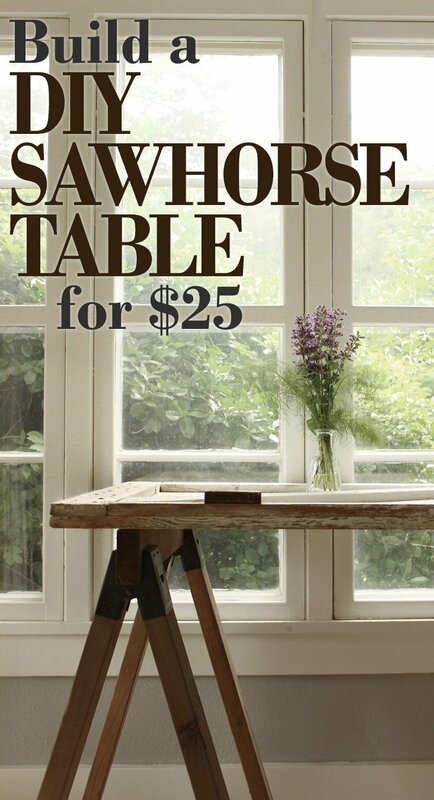 Once your sawhorses are assembled, you can place your tabletop across the top. 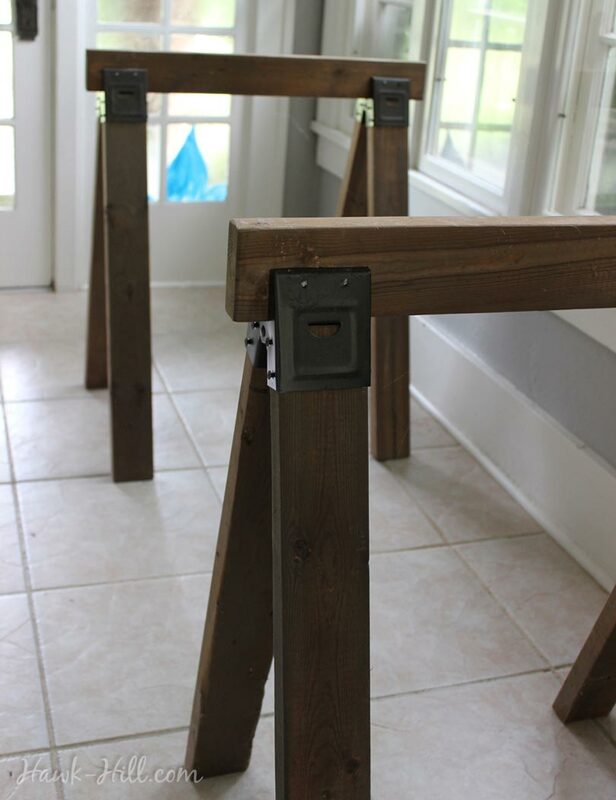 If your tabletop is heavy and your sawhorses are sufficiently wide to keep the top stable, you should not need to permanently attach the tabletop to the sawhorses. 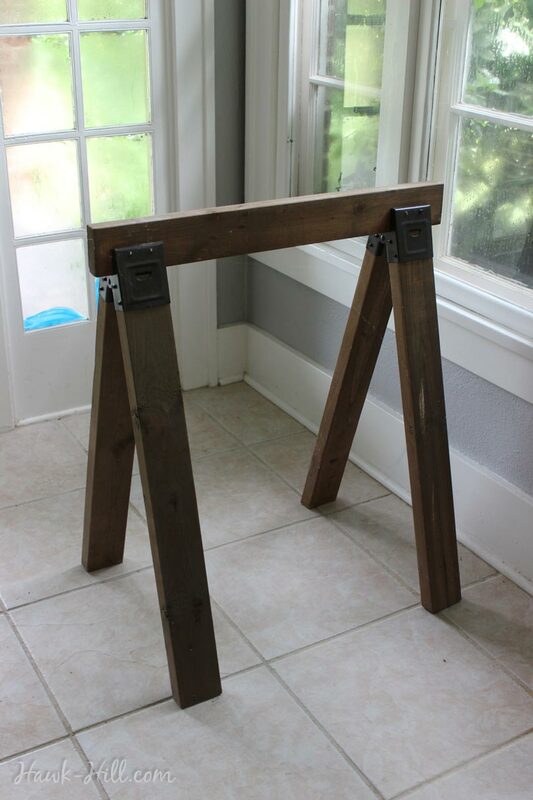 If you have ANY doubt about stability or if you’ll have children in your home, definitely secure the tabletop to the sawhorses. Standard 2×4’s stained with homemade oxidized vinegar stain, tinted darker with earl grey tea. 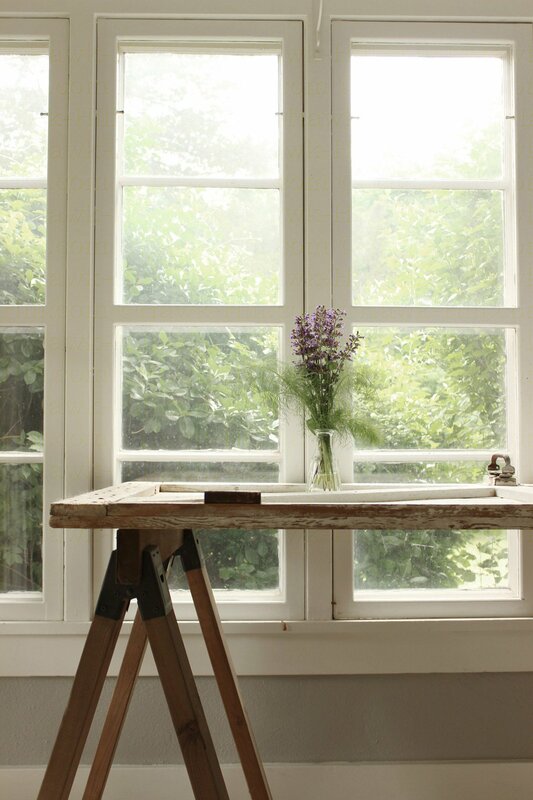 An “weed bouquet” arrangement of sage blossoms and fennel fronds on a home made DIY sawhorse table. Answer: No. Well, kind of yes, but mostly no. 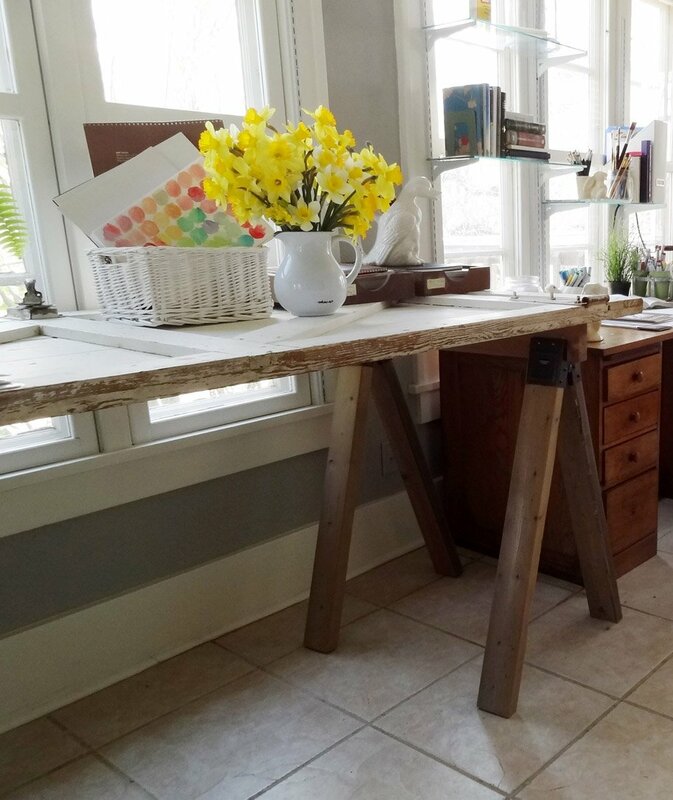 I mostly used this table for photography, organizing, and creating art. For the first two, the uneven surface was never a problem, but for painting or modeling, I did need to get creative. Solution: a lightweight, very rigid board that would not scratch my vintage barn door table top. After some brainstorming, I ended up purchasing a giant polyethylene cutting board like you’d find in a commercial kitchen. It’s rigidity made up for the uneven surface (as long as I placed it over one of the crossbeam supports), and the large size meant it had enough contact with the raised portions of the barn door to stay stable. As a bonus, the cutting board was impervious to my Exacto knife so I could cut right on my work surface, then slip the cutting board behind the larger desk when not in use.